After losing the Most Popular Song of the Year Award to Fancy Gadam at the just ended Vodafone Ghana Music Awards, Patapaa has won Most Popular Song of the Year Award at the 2018 edition of Music, Magic and Comedy Live (MMC LIVE). When the Most Popular Song which many were expecting will go to Patapaa’s ‘One Corner” went to Fancy Gadam’s featuring Sarkodie’s ‘Total Cheat’ Patapaa angrily stormed out of the auditorium and even stated that Charterhouse took “Stupid Money” and gave the award to Fancy Gadam. But Charterhouse released the voting results to justify why Fancy Gadam won and demanded an apology from Patapaa which he subsequently apologized. The Pa2pa soldiers are now excited and can go home in peace now that their boss Patapaa has finally won Most Popular song with the “One Corner”. 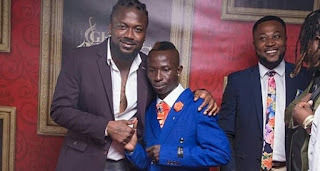 Since the award was sponsored by Huawei, Patapaa won himself a Huawei Phone. Among the artists that performed at the 2018 edition of Music, Magic and Comedy Live (MMC LIVE) were Jacinta and DKB with musical performances from Samini, King Promise, among others.